SuperZoo 2015 – How does it compare to 2014…and to GPE 2015? SuperZoo 2015 will be here next week. Officially, there are 983 exhibitors. That’s up about 7% from 2014, but still about 100 less than GPE 2015. So about 1000 exhibitors participate in both shows, right? Well, actually…No! Just under 600 exhibitors participate in both shows. 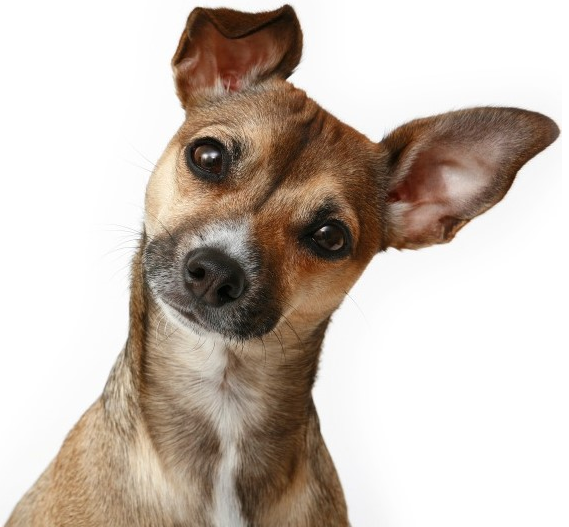 That means that of 1500 total Pet Show exhibitors, 900 only participate in one of these key shows. While both shows are important to companies committed to the U.S. Pet Market, they do have a slightly different focus. For example, SuperZoo has a higher percentage of independent retail attendees while GPE had over 3 times the number of exhibitors from outside the U.S.
Let’s do some comparisons. We’ll take a look at the exhibitor type and product mix and compare it to both SuperZoo 2014 and GPE 2015. Both shows have designated floor sections which pull together exhibitors with a common theme. Other than this segregation, neither show segregates the other booths in any way. The chart below and the ones that follow show the exhibitor count, % of total booths and directly compare SZ 2015 to SZ 2014. In the comparison to GPE 2015 we only show the % difference. Natural – The segment continues strong growth in all shows. SuperZoo is leading the way. Groomers – This section, like the Services segment, is growing and is a major emphasis at SZ. New Vendors – At least in terms of New Vendor section, there is no growth. Now let’s take a look at the classifications that I have made in conjunction with the Exhibitor Visit Planning Tool that I designed to make working these trade shows easier and more productive. Dogs and Cats are the pet “royalty” and increased in booth count but dropped slightly in “share” of booths as SuperZoo 2015 is showing more diversity..
SZ 2015 improved its offerings in Fish, Bird, Small Animal and Equine over 2014 but is still significantly behind GPE in all but Equine. Reptile is slowing for both shows. Business Services is showing the biggest growth. The other “non-animal” segments are flat or down slightly versus 2014. SuperZoo still has significantly more of all these categories than GPE which reflects their focus on independent retailers. Now let’s take a closer look at the “royalty” – Dogs and Cats. I have divided products designed for them into 32 subcategories. Here are this year’s top 10 for SZ 2015. The major difference between SZ 15 and SZ 14 is that Clothes/Costumes loss significant share and dropped from #6 to #7. Feeding accessories moved up to the #6 spot. In terms of share of booths, only Meds/Supp, Feeding Acc, Carriers and Grooming Tools actually gained. Vs GPE, the top 3 are the same. 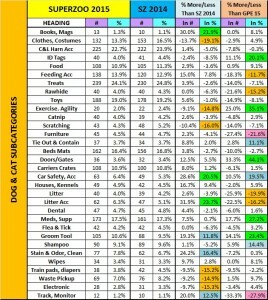 SuperZoo has a significantly greater amount of meds/supplements and Grooming Tools. Their wide lead in clothes/costumes has narrowed considerably. 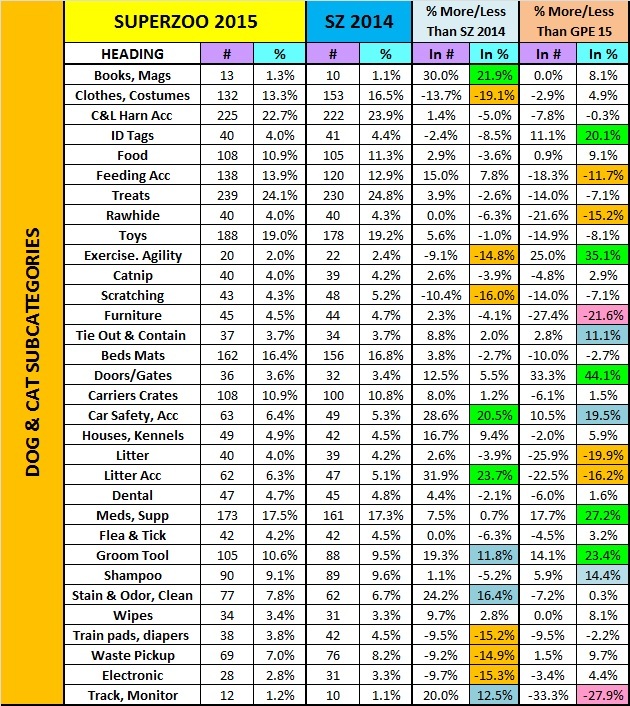 The full list of the “searchable” categories for Dog/Cat products and a comparison between SZ 2015 and SZ 2014 as well as GPE 2015 follows. Take a look at the categories that are of interest to you. I have color highlighted both positive and negative differences in “share” of booths when they exceed 10 or 20%. Note: The data input for all shows was derived from visits to over 1000 websites – per show. They’re not 100% accurate, but close. Although this post is primarily about SZ 2015, both SZ and GPE are “must attend” in the industry. Regardless of why you are attending the SZ 2015, having a productive show requires planning. It’s too big to just “wing it”. Go to the link below which will take you to my previous post. From there you can download a copy of my SuperZoo Super Search Exhibitor Visit Planner. It can’t hurt and it may help make your show more productive.